A retired couple purchased this home because it offered almost everything they needed on one level. They loved the location right on the Mississippi River and wanted to take advantage of the view. 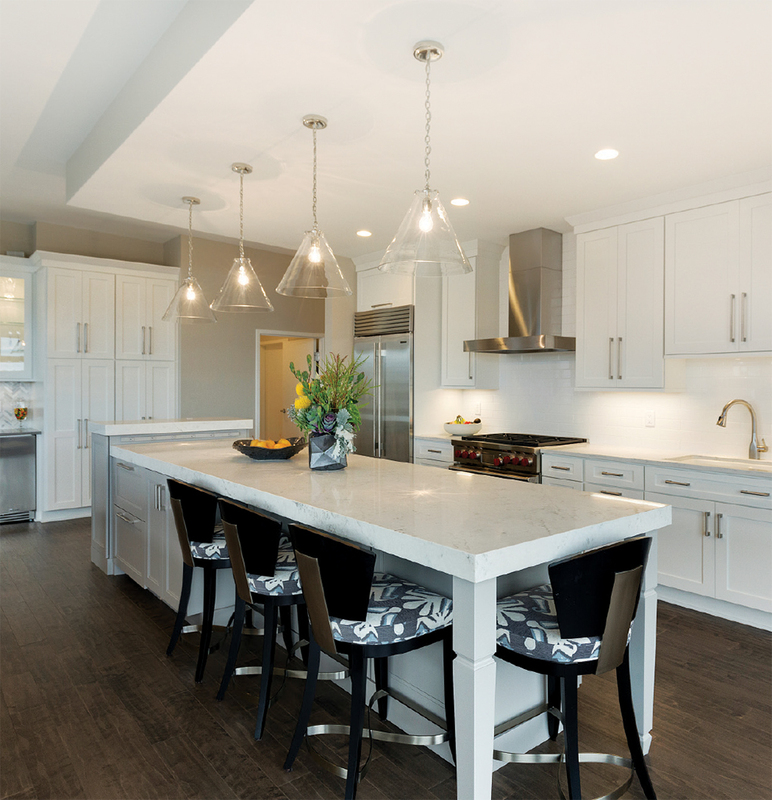 Their goals for the remodel: Transform the dark, ornate kitchen into a clean, contemporary space that would flow into the adjacent rooms and add island seating for four oriented toward the windows. The designer created flow by installing large floor tiles that run throughout the kitchen and into adjoining rooms. She added a beverage station with space for two beverage coolers and wine storage. 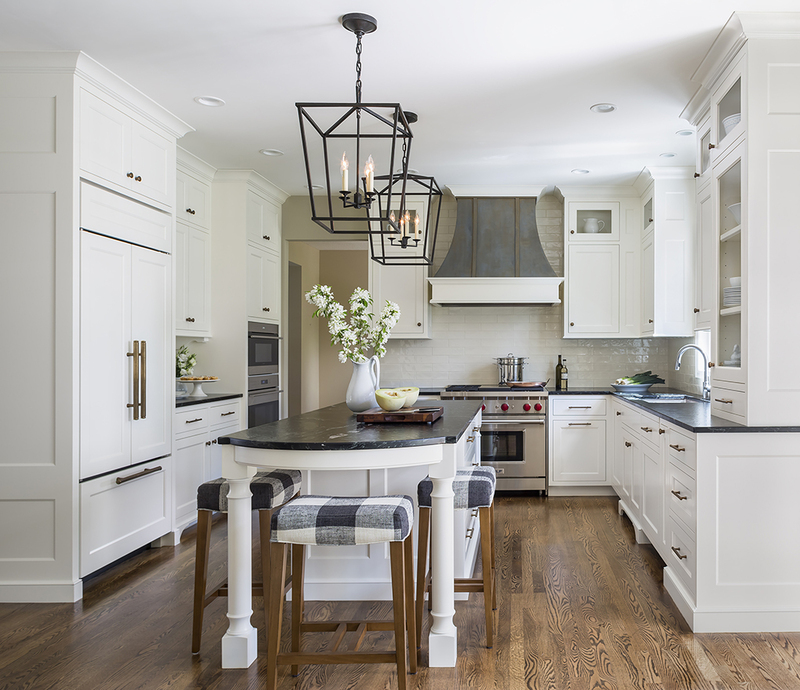 Layers of light—recessed downlights, under-cabinet lighting, and pendants—allow the homeowners to set the level they desire for cooking or entertaining. This client had recently downsized from a suburban home to a downtown condo, which offered a great skyline view and proximity to downtown restaurants and entertainment. The kitchen needed a style refresh and more. 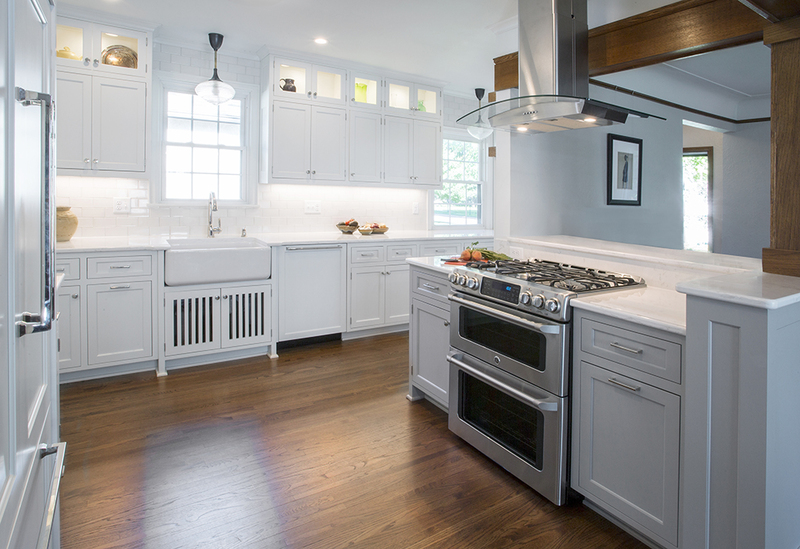 Since the homeowner loves to cook and entertain, high-end appliances were a must. A dual-fuel range, Sub-Zero refrigerator, and microwave drawer were arranged in the prep and cooking zone; the back side of the island features under-counter refrigerator drawers near the bar’s icemaker and beverage center. 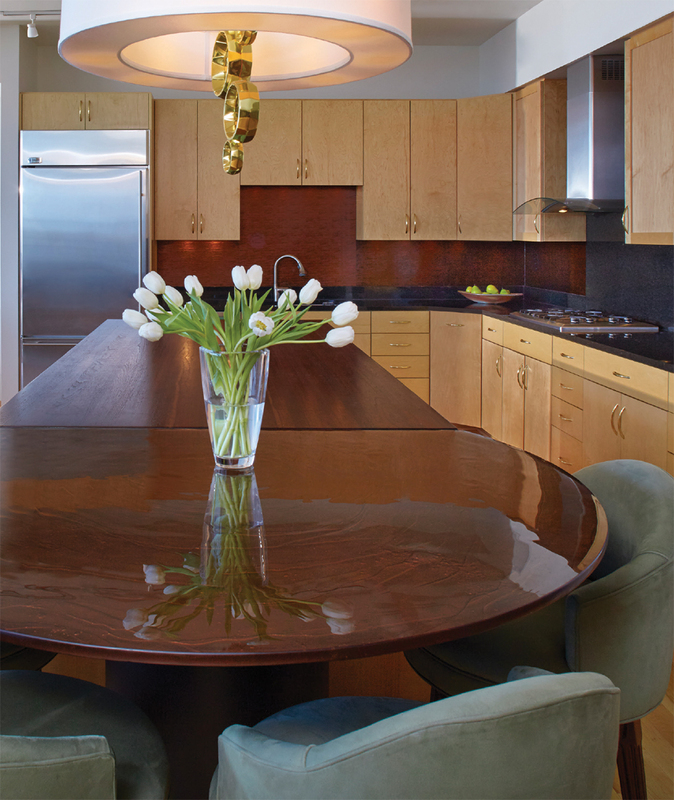 By changing out the dark woodwork and doors, updating all lighting to LED, and selecting crisp white cabinetry with marble countertops, the designer transformed the condo’s kitchen into a lavish and beautiful space. Stacy Sullivan, The New Old House Co.
After looking for years for a location to build their vacation home, these homeowners finally found the perfect property overlooking Lake Pepin in Wisconsin. The home would be used for large weekend getaways with family and friends, and the kitchen had to function flawlessly while also taking advantage of the beauty outside. The architectural plans were lacking the impact the client desired, so the space was rearranged to create symmetry and take advantage of the spectacular views of the lake and birch forest. To better host large gatherings, the homeowners installed a 48-inch range and two dishwashers that could be used for high-volume cooking and cleaning. 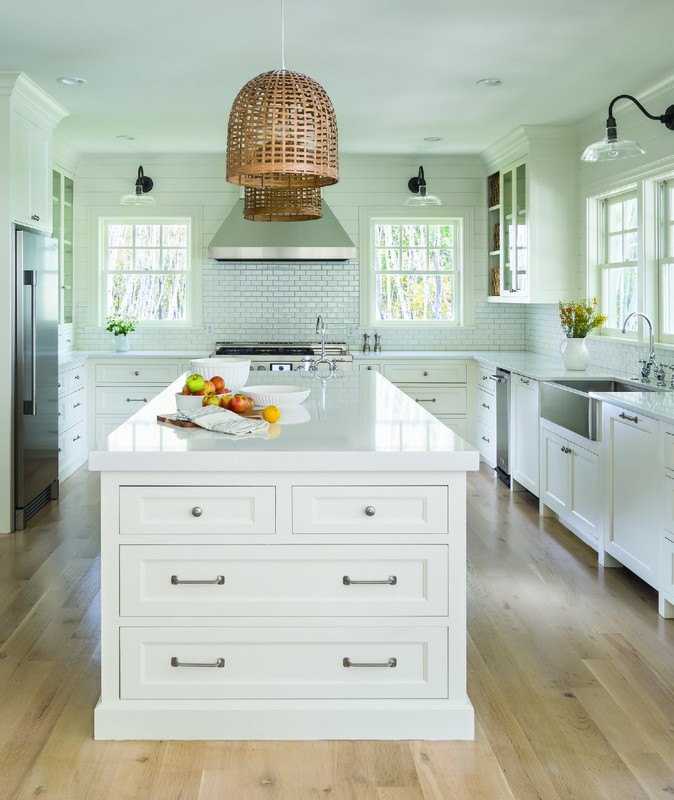 They created a modern farmhouse aesthetic by using a white palette that feels fresh and cheerful. So much opportunity awaited in the kitchen of this Minneapolis townhome. 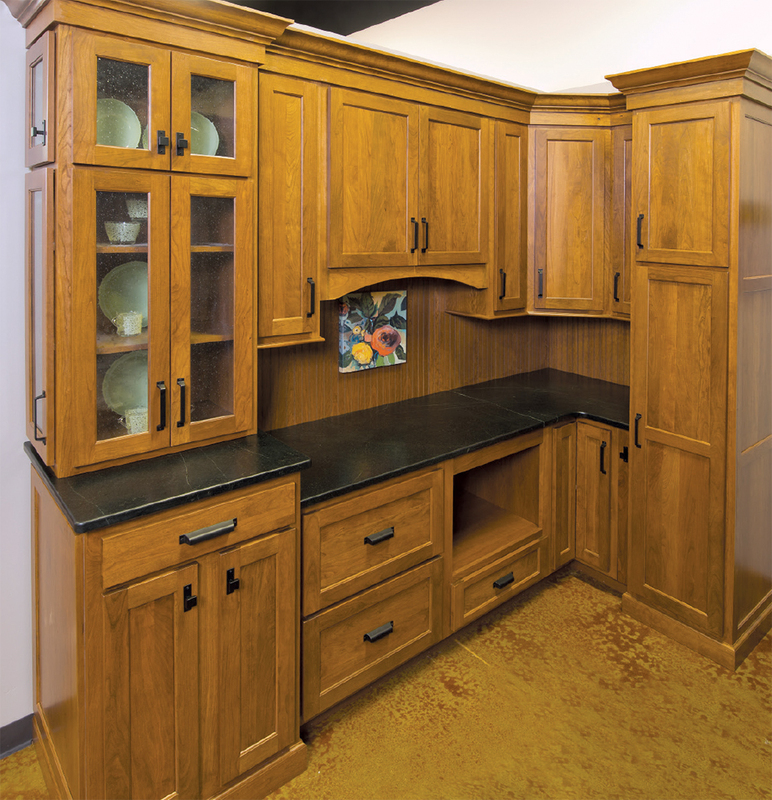 Tops on this client’s “must-go” list: poorly used space for the refrigerator, closet, and eat-in kitchen table. 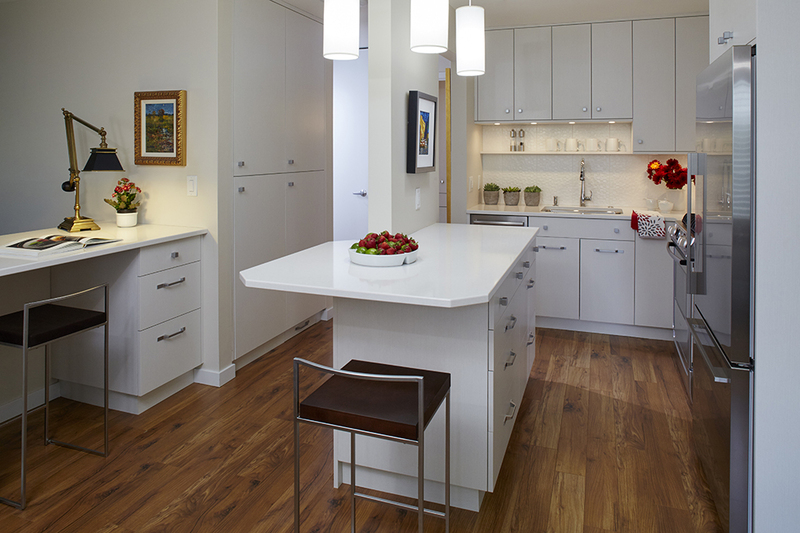 A built-in counter for kids’ seating was a priority, as was their love of cooking and baking. For starters, the geometric wall formation was removed to open up the kitchen to the dining and family room areas. The unused eat-in table was traded for a built-in prep counter and kid zone. Textural melamine with splashes of tangerine are interwoven to create a striking, yet harmonious color palette. Durable surfaces for this growing young family will provide them with a creative and functional space for years to come. She is a baker. He is a cook. The homeowners needed a space where their expertise could come to fruition. First to go: some of the partition walls. With the added square footage, the design began to develop. The baking area was placed at one end of the kitchen to separate prep areas from baking. A lower counter at 32 inches, the perfect height for kneading dough, anchored that area. The homeowner, a wood craftsman, created the intricate Burmese teak floor. 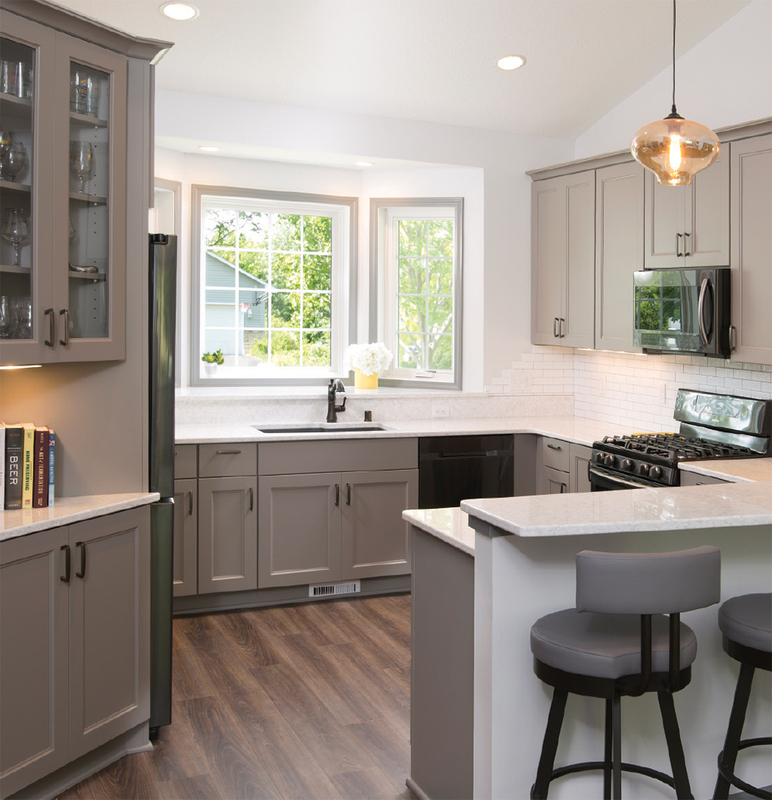 White inset shaker cabinetry, Labrador Brown granite, and white subway tile come together with subtly painted walls to invoke a sense of tranquility. It’s as if nothing had changed, but everything now belongs. 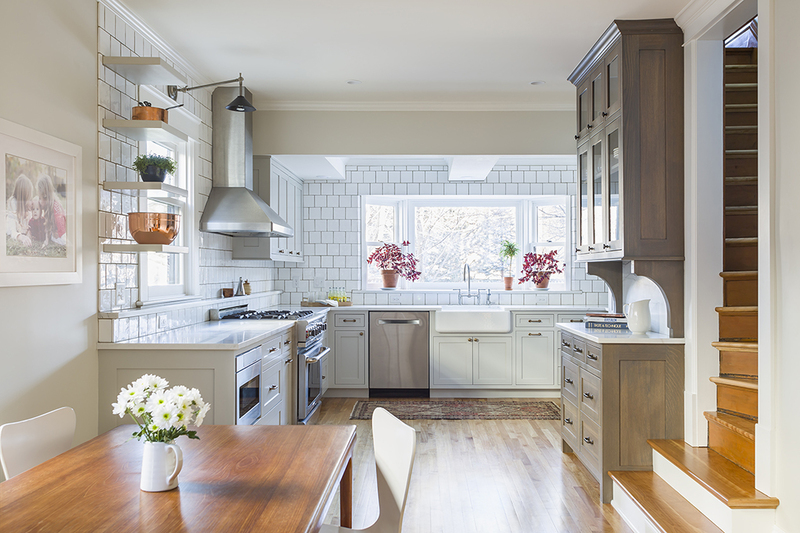 The young homeowners, one of whom is an up and coming chef, wanted to transform the tiny kitchen in their split-level home into a functional space that would accommodate cooking, entertaining, and family life. To achieve this, the designer incorporated the bay window into the kitchen, substituting shorter windows that allowed for a raised ledge behind the sink for the chef’s herb garden. She also removed the two partial interior walls between the kitchen nook and dining/living room to create an open floor plan. 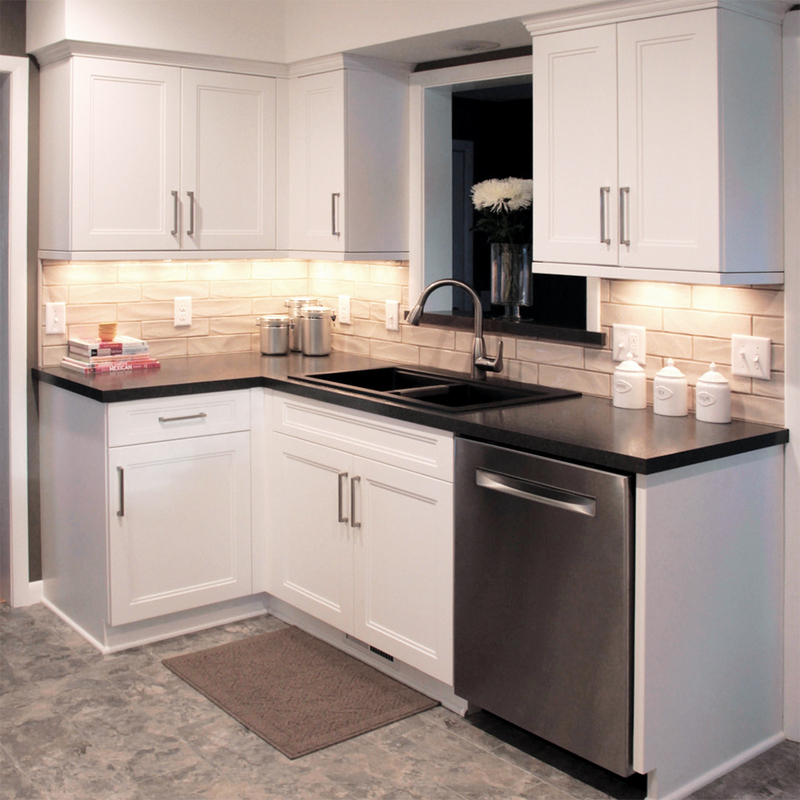 Cabinetry painted medium gray and white quartz countertops are durable and low-maintenance finishes. Large storage drawers with rollout shelves instead of standard base cabinets make it easier to gather what they need even when their hands are full. This client’s residence is a modern interpretation of a Prairie-style home with fabulous lake and city views. 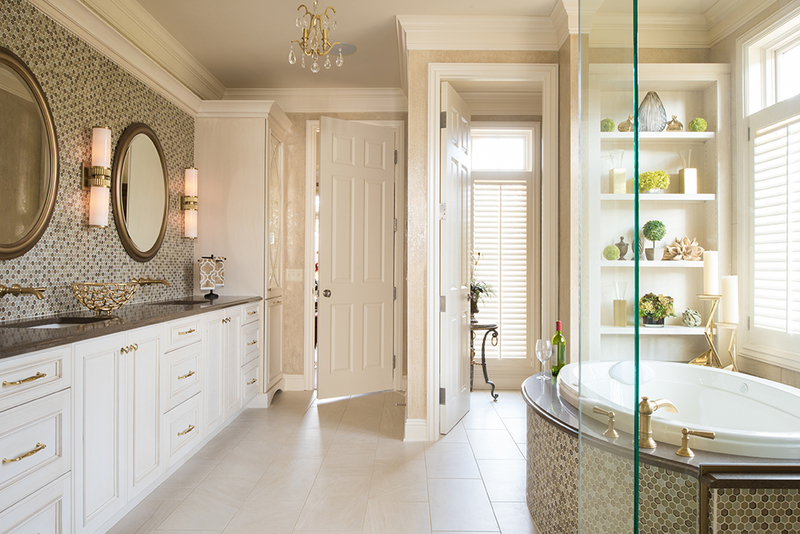 The couple wanted their master bath to become a serene and balanced space where they could each prepare for their days. Their wish list included a large walk-in closet, dressing room, and laundry space; his-and-hers vanities, a coffee station, and more natural light. The designer converted the bedroom adjacent to the bath into a walk-in closet, while the existing walk-in became the laundry and dressing room space—which also provided a perfect place for a coffee station with easy water access. A new entrance separated the vanities and masterfully achieved balance. When this couple sold the suburban home where they raised their family, they decided on a lifestyle change and relocated to a penthouse. 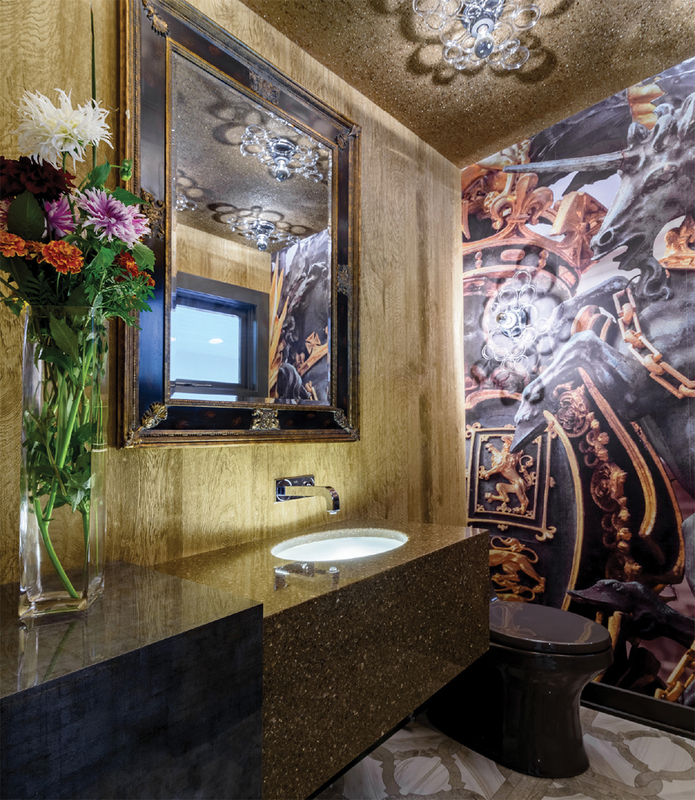 They lived in the two-bedroom condo for a couple of years before purchasing the adjacent condo and expanding the footprint to create additional living spaces and this stellar master bath. They wanted it to feel like a clean and bold hotel suite. To incorporate all their desires—his-and-hers closets and vanities, a hospitality station, and concealed storage—the designer divided the space into individual components. The laundry, hospitality, and folding stations are located on the wall adjacent to the bedroom to provide a natural flow between the walk-in closets. For this modern interpretation of a Prairie-style home the homeowners wanted to reflect their casual sophistication, world travels, safari hunting expeditions, and love for Chinoiserie art. Clean architectural lines and an organic contemporary flair is fashioned into every space in the home. The homeowners wanted to extend this style into the powder room with a special challenge: The room, located on two outside walls, includes a mail drop. The designer considered that an opportunity to create an art niche, storage for toiletries, and a place for mail to drop unnoticed. She achieved a bold look with a ceiling made entirely of glass beads that sparkles in the light and the large mural on the far wall. 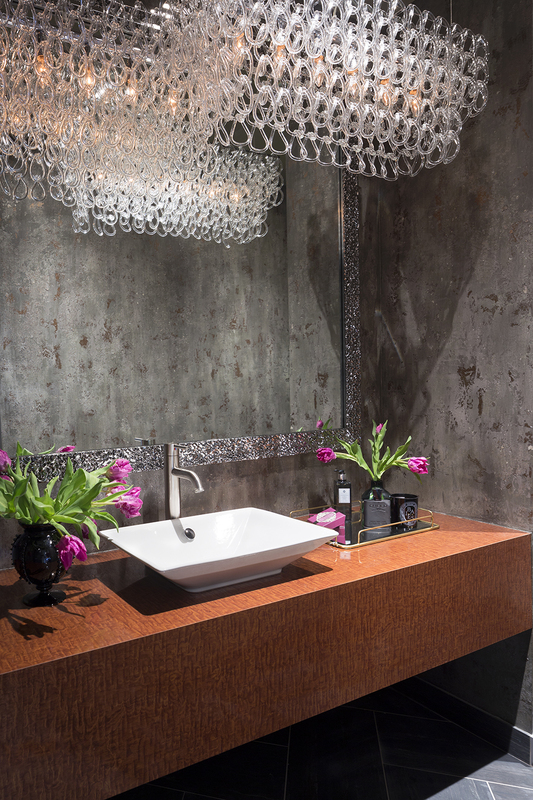 A couple living in a Minneapolis downtown industrial-style condo wanted to transform their powder room from a space that felt like a utility closet into a “wow.” The design challenges were many: dark and dated finishes, glaring lighting, and a door that opened to hit the entrance door into the condo. Since the couple also has two preschool age children, they wanted to use only kid-proof materials. 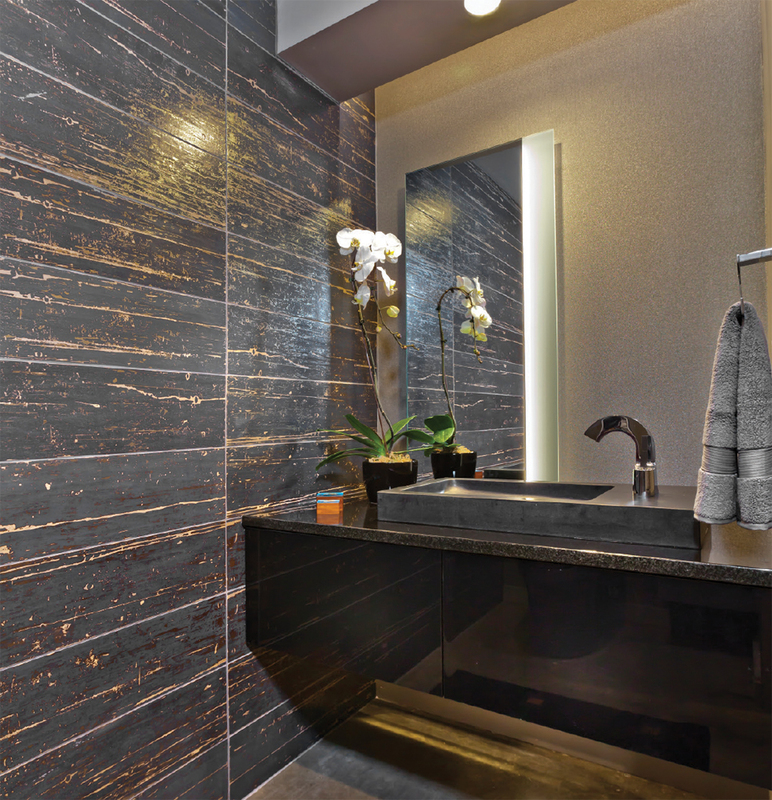 The designer went to work, adding a cantilevered vanity with black laminate drawers and a sink in a solid slab of honed black granite. A porcelain tile entrance wall in a deep blue and silver and low-maintenance vinyl charcoal wall covering add texture and interest. A long linear slot was cut in the existing maple door and textured, colored glass inserted to bring in some light from the adjacent space. 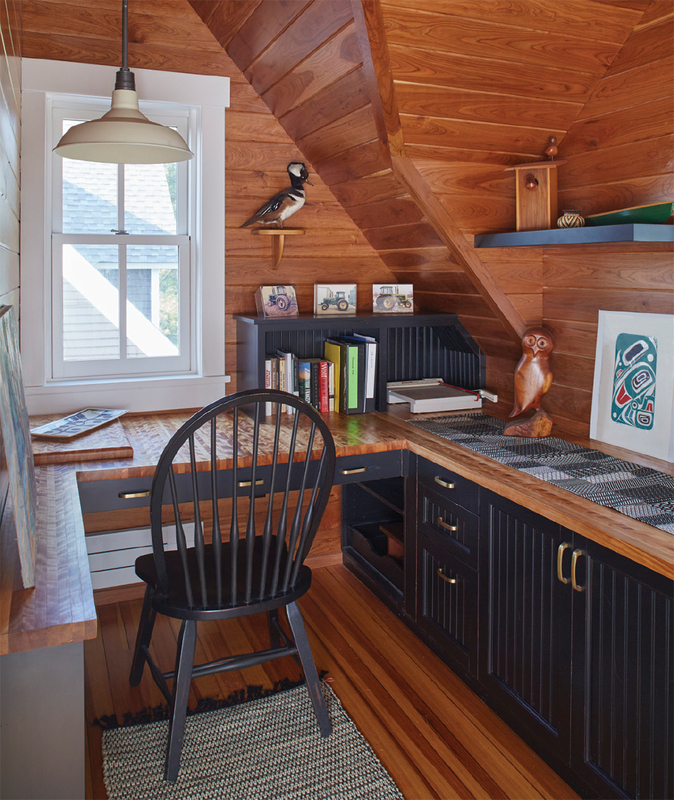 A tiny corner of an old farmhouse was the perfect spot to carve out a charming nook. The client wanted a small, but functional, office to fill the awkward second-floor space. Barely coming in at 6.5 by 8 feet, a lot needed to be packed into this little nook. Original flooring reclaimed from the first floor and cherry wood harvested from the client’s land clad the floor, ceilings, and walls of the space. 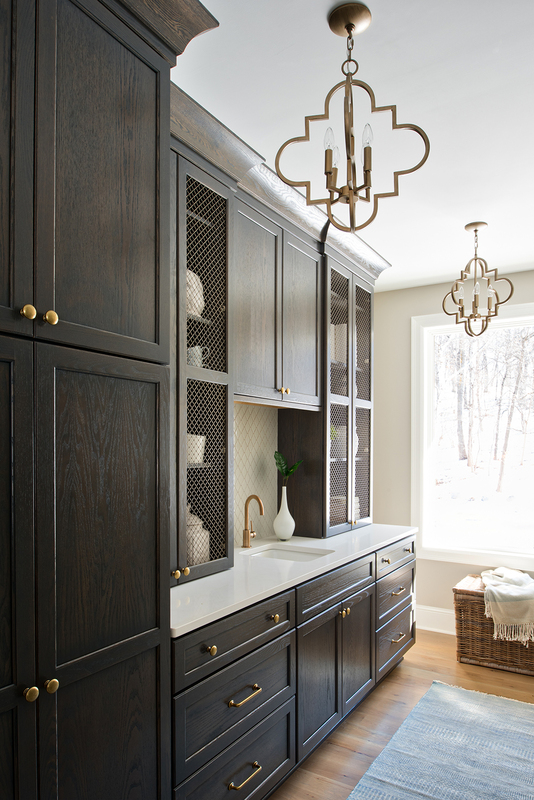 Black opaque-stained cabinets separate the woods, and create a desk and credenza covered with a “wood-look” laminate countertop. A hanging light, a floating shelf… and there you have it: Out of a tiny “unusable” corner comes a fully functioning and cozy Wood Nook. The master bath was added to this 1937 house during a 1988 remodel. Now outdated, the bath needed a transformation to the clean and classic design the clients desired. Since the footprint of the room had to remain the same, the designer carefully planned the space accordingly. 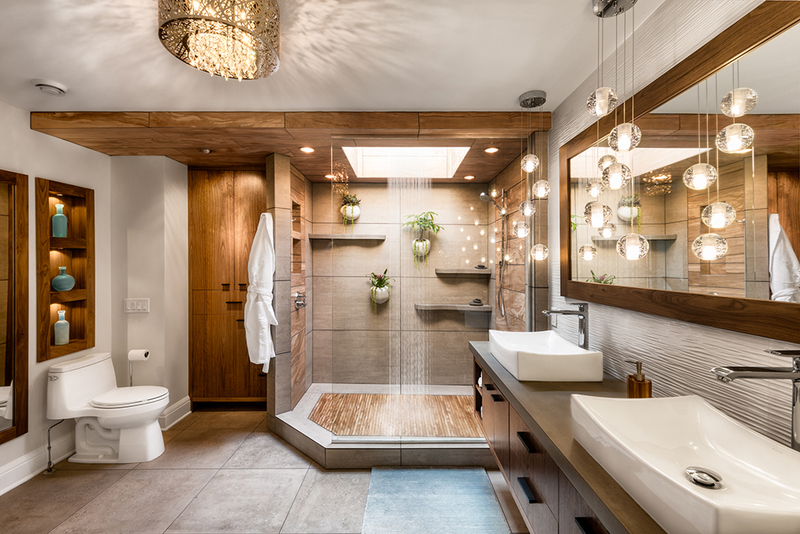 By replacing the entry door with a pocket door, installing a compact toilet, and replacing the tub with a large walk-in shower and clear-glass shower door, she created more room for storage and gave the room a more spacious feel. 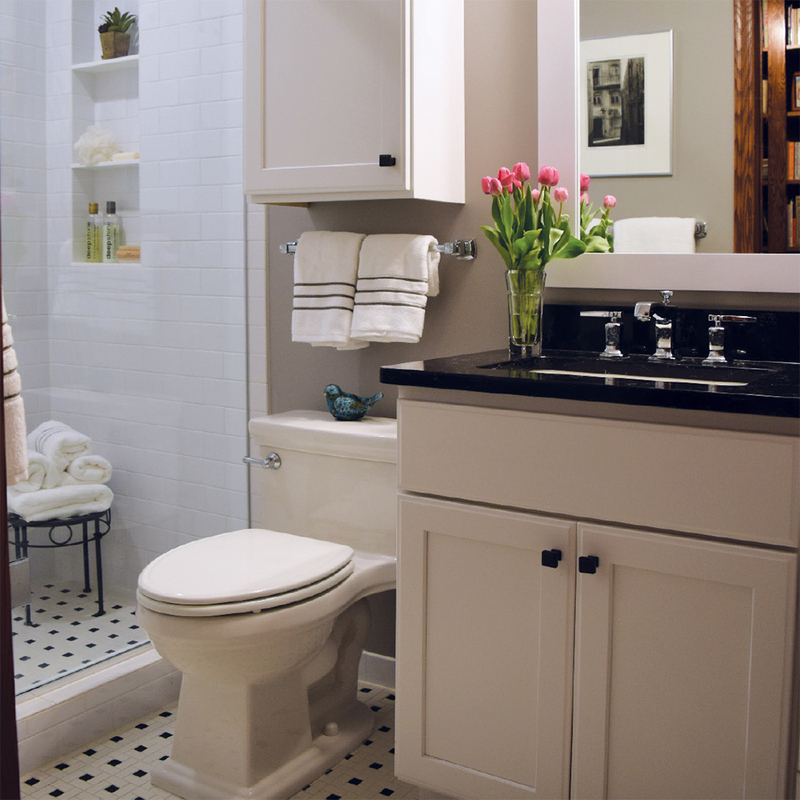 The black-and-white palette and pinwheel design on the tiles kept the bathroom simple yet classic. The designer’s goal with this showroom space was to blend the trends she sees emerging with a cool, modern, and fun edge. Transitioning modern into Minnesota involves warmer colors, texture, and depth. Creamy white paired with a rich and earthy textured melamine provided the perfect canvas for this design. 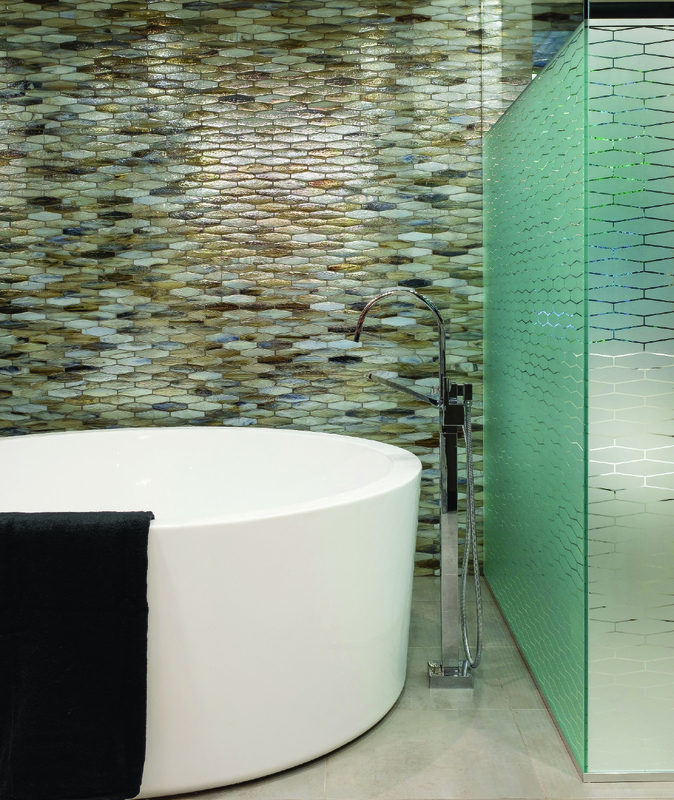 A bubble mosaic backsplash, bubble-glass doors, and decorative spheres was a fun way to make a statement in an otherwise angular space. In order to make this kitchen functional as well as beautiful, Preuss incorporated cabinetry accessories to emphasize organization, such as a hands-free waste bin, knife and utensil pull-out, container and Keurig K-Cup organizers, dishware drawers, and a tall pantry pull-out. The designer knows how important it is to utilize every inch of valuable space when displaying a showroom remodel. She wanted to showcase all of the roll-out tray options available through the cabinet manufacturer, so she displayed the wood tray dividers in the top section of the pantry, wood lazy Susan options, and two different spice storage options. Since base microwaves are becoming more prevalent in today’s kitchens, it was important to show this manufacturer’s standard base microwave cabinet. She also showed specialty cabinets, including a two-drawer base with a hidden storage tray and a wall cabinet with a hidden mail organizer. This downtown condominium makeover blends form, function and beauty drawn from a distinctive river view. One of the key design goals was to create a backdrop for the homeowners’ Asian folk art collection. 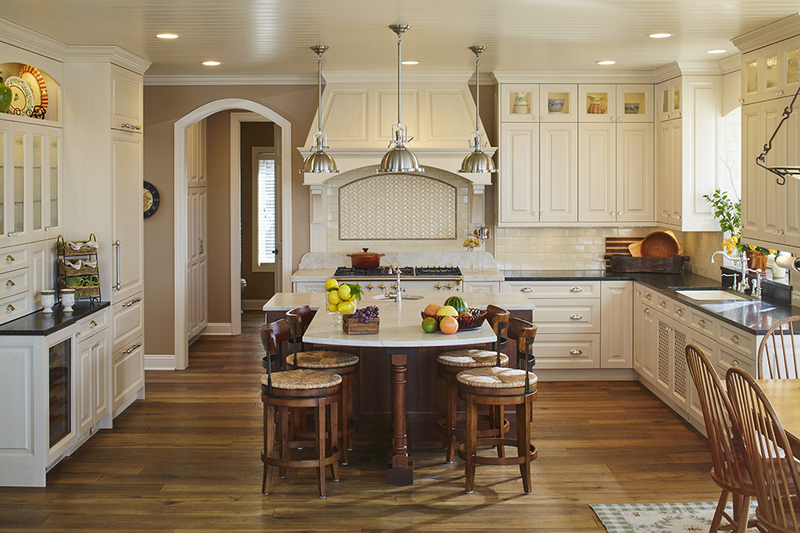 While the existing perimeter of the kitchen remained, a bar area was added for entertaining. A new, larger island was designed, including a custom-made Peruvian walnut countertop with an attached custom-designed molded glass table. The basket weave pattern in the glass is reminiscent of an Asian hand-woven basket, and the custom-designed textured glass backsplash in the kitchen and bar has a grass cloth feel. Together, the amber- and copper-colored glass visually warm the space and add contrast to the light maple cabinetry and flooring. 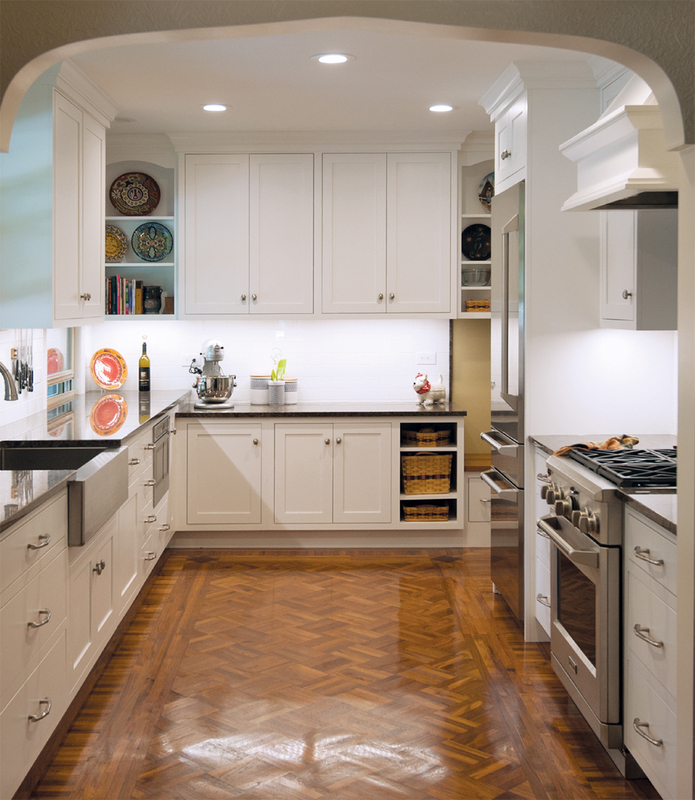 The owner of this 1950s rambler wanted an updated kitchen that was timeless, fresh and blended with the style of the rest of the house. To keep cost down, the existing layout remained the same. The designer centered the range on the space available and reconfigured the cabinetry, adding drawer storage for better accessibility. She also added cabinetry below the window to create more prep space and maximize storage. The client wanted warm grays and neutral taupes to complement the neutral brown color palette of the rest of the house. New vinyl tile flooring, which the client laid herself, is gray with warm brown tones that match the existing oak flooring in adjacent rooms. The owners of this midcentury home, young design professionals with two small girls, wanted a kitchen updated aesthetically and functionally. They wanted an open floor plan to better reflect the home’s midcentury past and give them space for dining, cooking, and entertaining. 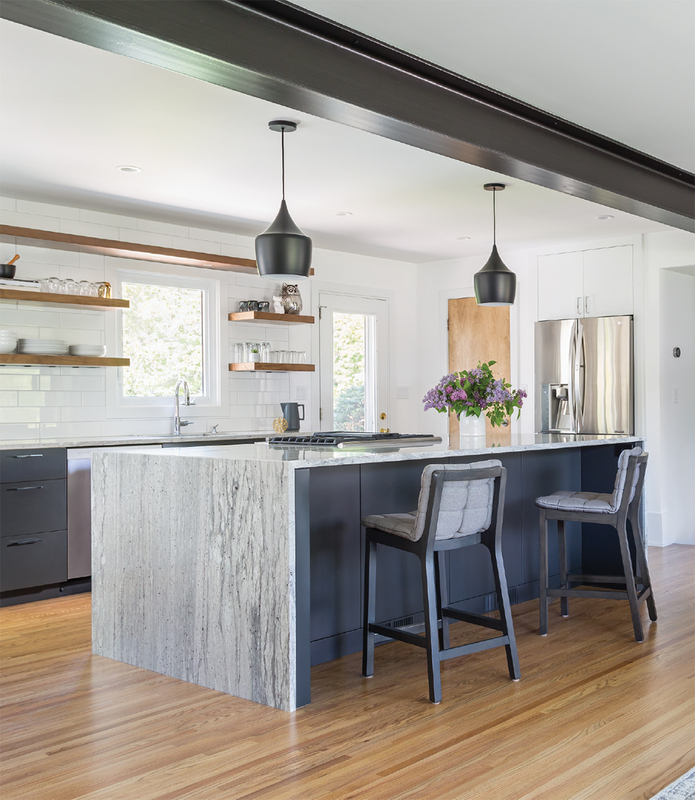 The designer removed load-bearing walls and replaced them with the steel beam, left exposed and painted charcoal gray for interest. 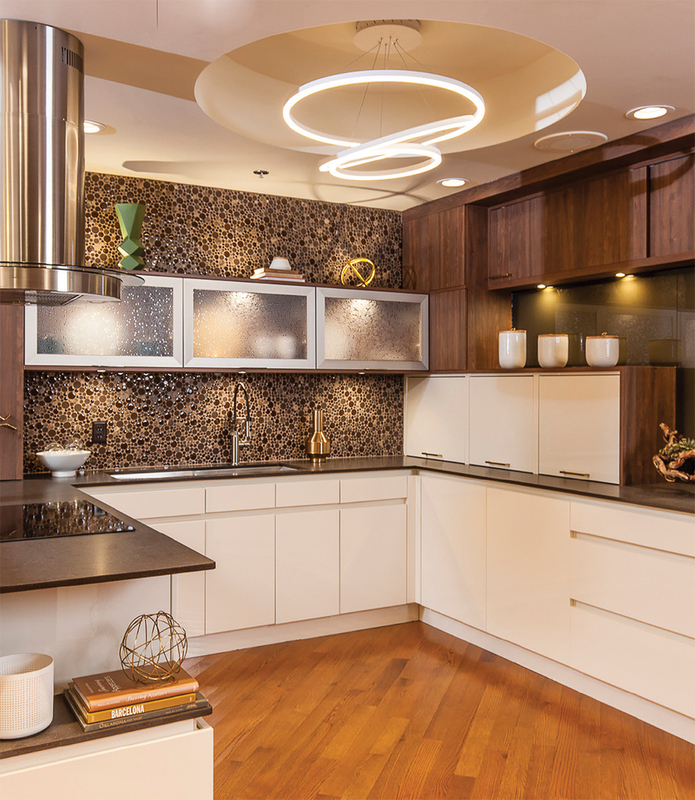 Floating walnut shelves store dishware and add a focal point to the kitchen, while frameless cabinetry creates clean lines and the island’s waterfall countertop adds a modern touch. Gray and walnut tones add warmth to the space. This kitchen used to be a cold white space that did not match the personality of the family living there. The homeowners wanted to create a comfortable, yet sophisticated place to prepare meals, informally entertain, and enjoy time together. 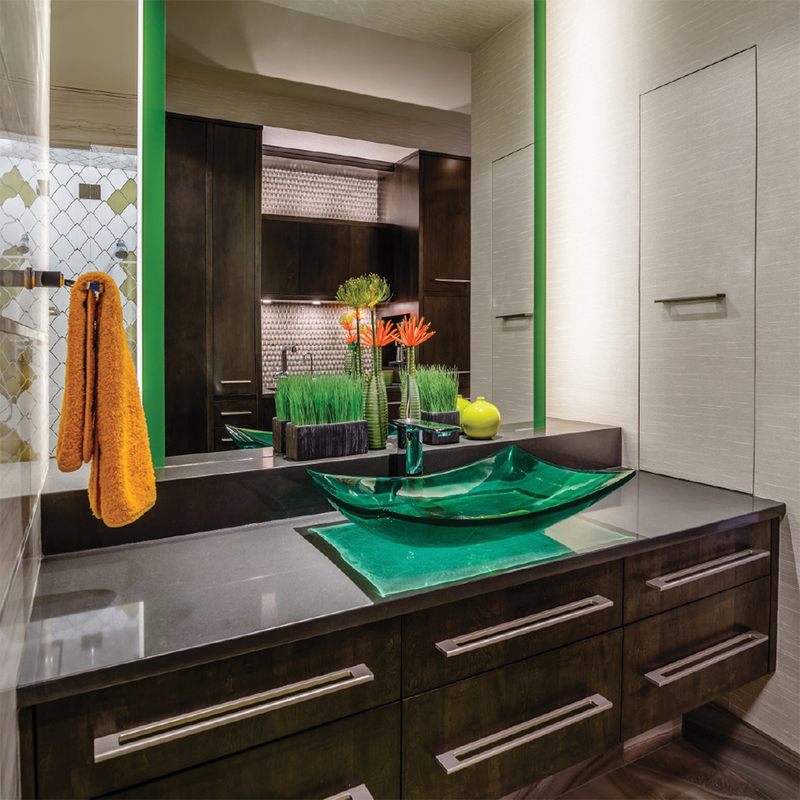 The designer created interest by mixing physical and visual textures and colors in the island countertop. 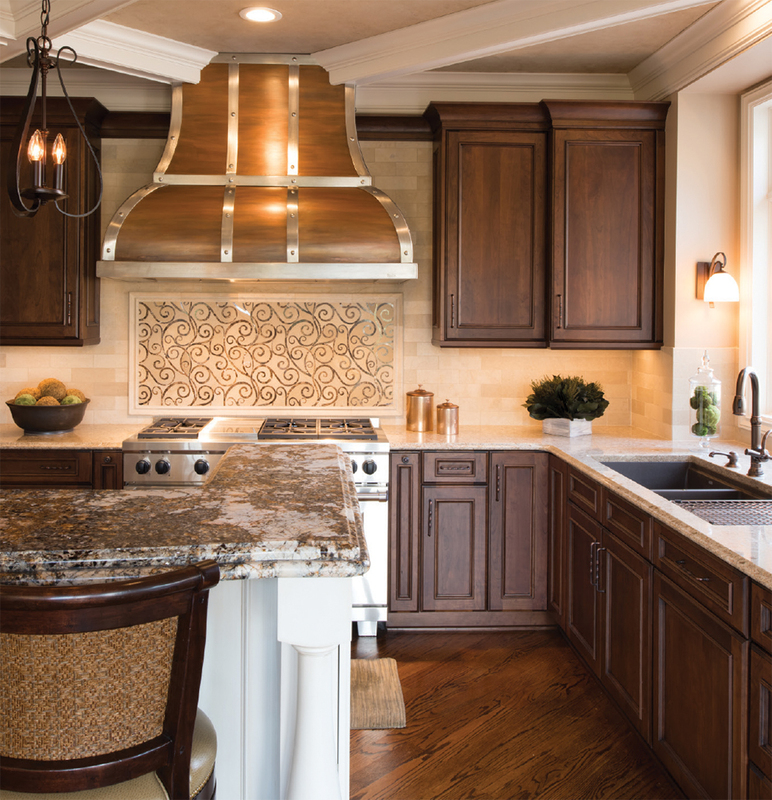 A custom hood, ceiling beam details, caramel-toned wood cabinetry, and an artful backsplash bring warmth and life to the kitchen.